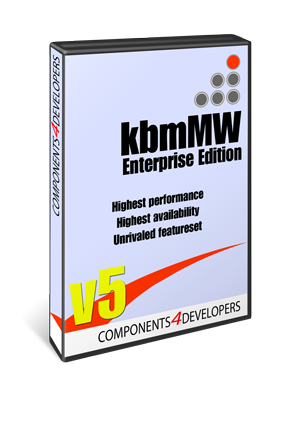 ANN: kbmMW Professional and Enterprise Edition v. 5.04.10 released! We are happy to announce v5.04.10 of our popular middleware for Delphi and C++Builder. – Fixed bugs and improved XML<>ON conversion. – Fixed bugs in TkbmMWConfiguration. – Added OnAccessException event to TkbmMWCustomFileClient. Checksum(Ex) and LocalChecksum use SHA256 to calculate checksum. SameFile(Ex) calculates checksum on both local and remote file and compares those. On platforms supporting TkbmMWScheduler, the calculations are run in parallel. piggybacking additional data to events. – Added WhenException methods to TkbmMWScheduledEvent to allow handling exceptions. multiple parallel jobs that will be run under control of one scheduled event. Only when all jobs has run, the scheduled event is considered to have run. should prefer defining XML node values as attributes or as elements. should include index (i) attribute to precisely identify a row in an array. – Updated many database adapters to prevent certain leaks on exceptions. that is allowed to be received by the server. Default no limit. 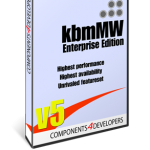 – Added TkbmMWVirtualConfigurationStorage to kbmMWConfiguration unit. It allows for getting and storing configuration from any type of medias. – Added TkbmMWMarshal.Bytes2Memory function in kbmMWGlobal. – Added ToString to IkbmMWAutoValue. strings with start and end tags as delimiters. – Added PrettyChar2String function to IkbmMWLogFormatter. – Made Char2PrettyChar function in IkbmMWLogFormatter implementers public. – Added TkbmMWThreadONObject and TkbmMWThreadONArray to kbmMWObjectNotation. They allows for multithreaded access to the same base object notation object or array. – Added additional support for CoInitialize and CoUnInitialize for UNIDac adapter. – Added BasicProperties property to IkbmMWAMQPChannel. – Updated database adapter wizard to generate up to date code. – Improved stability of TkbmMWFileService, TkbmMWFileClient and TkbmMWFilePool. – Improved error handling in kbmMWORM. – Fixed bugs in TkbmMWScheduler. – Fixed compilation errors in AMQP on some IDE SKU versions. – Fixed header properties not available under some circumstances in AMQP. – Fixed bugs in TkbmMWAuthorizationManager. – Fixed bugs in kbmMWConfiguration. – Fixed bugs in kbmMWHTTPUtils resulting in stack overflow. – Fixed some null handling issues in TkbmMWObjectNotation. – Removed leftover debug code from TkbmMWBPStringMaskPart. – Fixed bugs in TkbmMWAMQPChannel. – Fixed NULL marshalling issue in TkbmMWONNullableMarshal. – Fixed kbmMWServer not instantiating minimum number of services at startup. – Fixed IDE Debug visualizers. – Improved GetStreamEx and PutStreamEx to allow for retry on failure in TkbmMWCustomFileClient. – Generally improved exception and error handling in TkbmMWCustomFileClient. – Improved PutStreamEx to include offset and total file size in server call.